It’s the World Cup in Rio next year so you’d better get used to football-themed footwear from now until then. 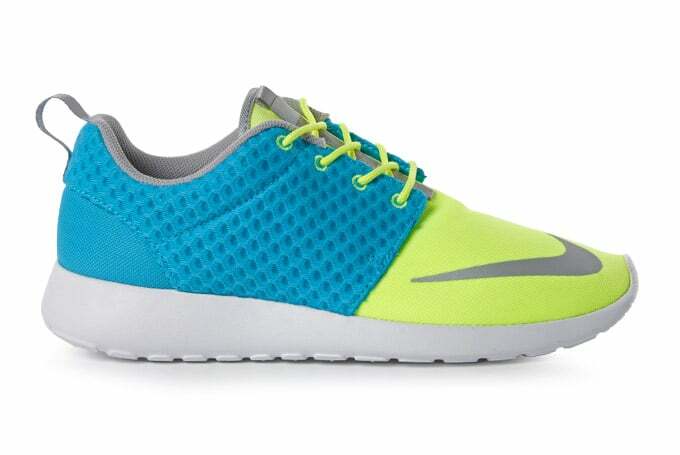 Bizarrely, the simplicity of the Nike Roshe Run has become an early part of that rollout as the Nike Roshe Run FB. We don’t know why this model has been picked, but we’re guessing that it’s down to the shoe being a hype successor to the AM1-mania (though the Air Max 1 has an FB variation too that’s coming to the store soon). While that vaguely Yeezy-esque variation had kids queuing for a couple of hours a week or so ago (if you told us six months ago that kids would be camping for Roshes, we would have laughed in your face), this one’s nice, but a lot bolder than the one that caused all the fuss. We know that there’s a certain aggravation on behalf of those that loved this shoe as the zen-like respite from all the nonsense and are seeing their personal private space getting disrupted by an influx of excitable individuals who don’t know why they want stuff (they just do), but is it any comfort (both literally and figuratively) that the Roshe is still a refuge for the foot on the inside, beyond the colourful applications and extra details, via that Lunarlon sockliner that’s based on rake marks in sand? That Torch fabric style overlay gibes it some extra texture contrast and the Current Blue and Hot Lime colours reminds us of the old Air Flow palette a little, but that forefoot swoosh not being 3M? Missed opportunity. We still wanted a bit more from the NIKEiD options with this model in terms of palette, but we can understand that the less is more mantra that informed the shoe was probably in place. We still think too much detail and a big RRP defeats the object of this shoe a fair bit. These get a pass from us though, because they have some serious scope for summer wear — they’re on sale in the Crooked Tongues store right now.